Lebanese food is for sharing. That in itself limits my choices as a solo diner. I wanted to try as many things as possible, thus, hot and cold mezzes were my best options. And my busy program allowed only quick bites for lunch (though my driver brought me to very local places! Yum!). 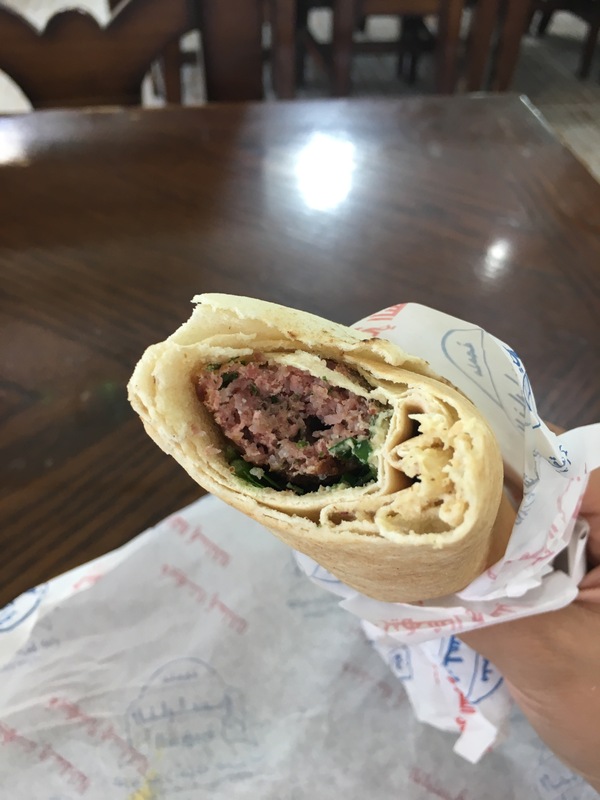 On quick note, I tried two places (M Sahyoun Falafel and Barbar Sandwich) that are highly rated in the reviews, and I was quite disappointed with the taste. 1. Kaak (sesame bread in pocket shape) sandwich filled with labneh and olives and thyme at Abou Arab (on the way to Chouf Cedar Forest). It is a very local place and it was very crowded. The options for toppings were varied from savory to sweet. I decided to stick to traditional local flavors. Filling kaak (sesame bread in pouch shape) with Labneh (soft yogurt/cheese). 2. Safiha at Lakkis Farm restaurant near Baalbeck in Douris. 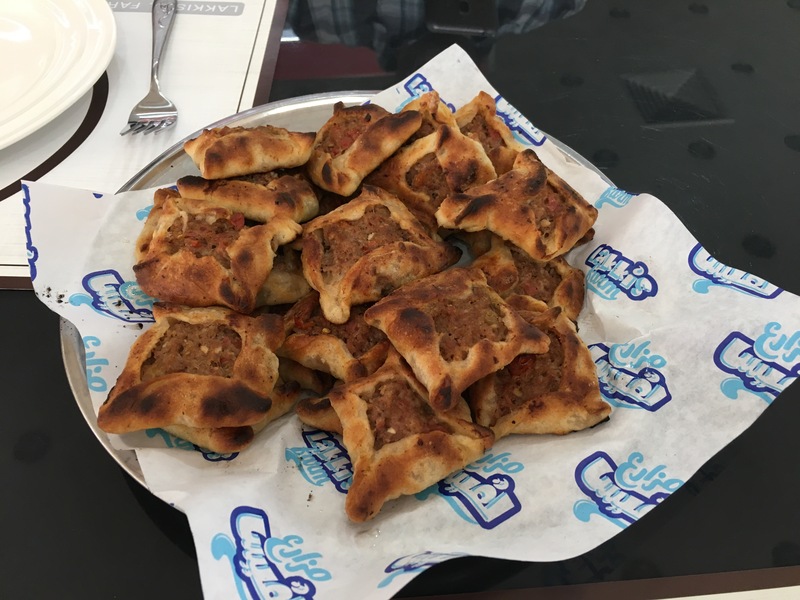 Safiha is a baked dough topped with lamb meat. Delish! I told my guide/driver to order only six pieces. I am glad he never listened to me. The ingredients of the food they serve in the restaurant come from their own farm. Freshly baked safiha from Lakkis Farm. The safihas being prepared next door to the restaurant. 3. Lamb sandwich at Nablus Butchery near Sidon where the lamb is freshly butchered and freshly grilled. This place is very local and affordable! My only regret, I only had lamb sandwich! Lamb sandwich at Nablus Butchery near Sidon. 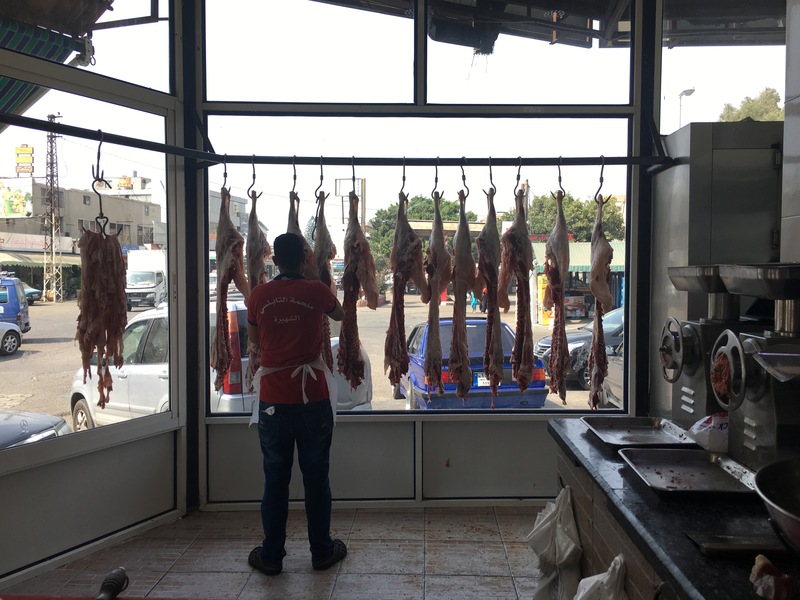 Fresh lamb at Nablus Butchery. 4. Kunefe in Al Sharq Sweets and Taj Al-Mouluk. 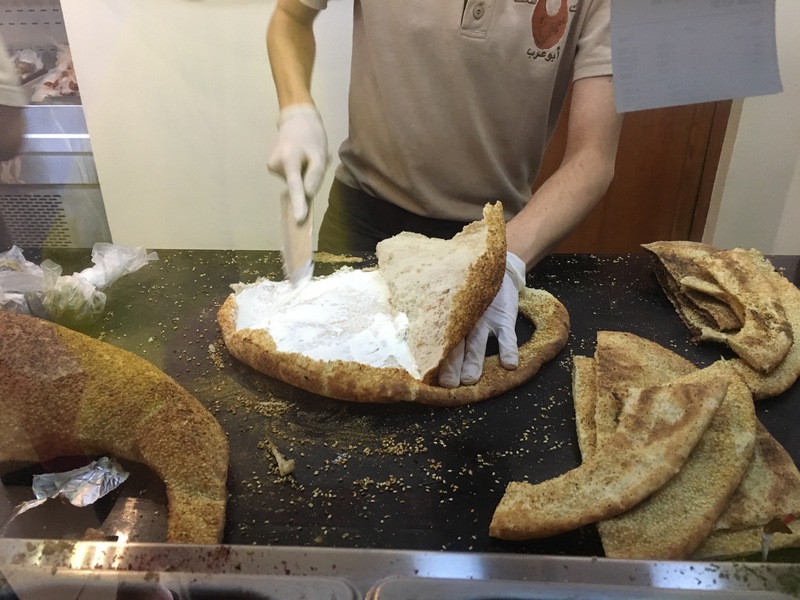 In Lebanon, they take kunefe to a new level by serving it in a sesame bread roll. 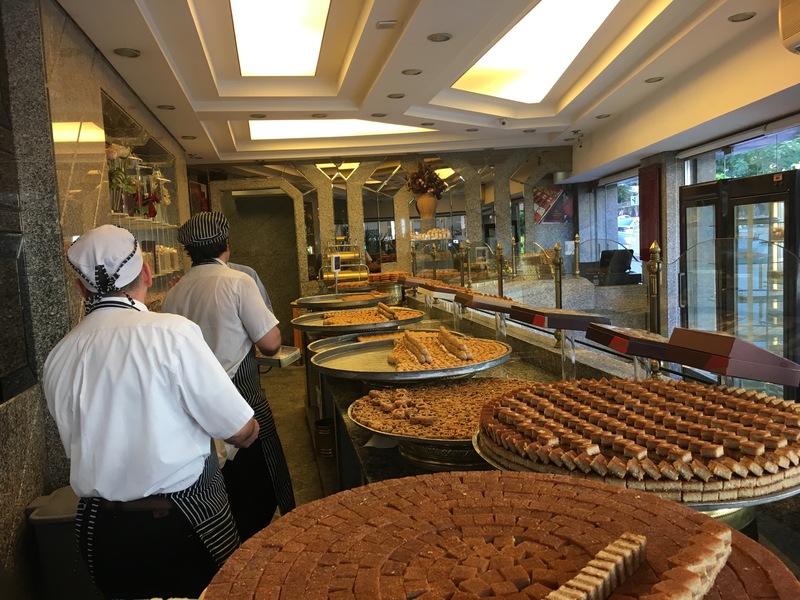 Both places serve delicious kunefe, but I was told they are not even the best in Lebanon. So a return trip to Beirut is a must! Kunefe at Taj Al Mulouk. I had their kunefe for breakfast before heading to the airport. 5. I had sujouk sausage and dandelion leaves cooked in olive oil, and topped with fried onions at Em Sharif Cafe. Both dishes are part of the hot mezze offerings. I never knew how a simple leaf can taste so delicious! It does not look much, but how they cook it is very flavorful. The cafe is located near Four Seasons hotel in Downtown Beirut and its clientele is of the hip, globetrotting crowd. I wanted to try the original Em Sharif restaurant, but it was fully booked. 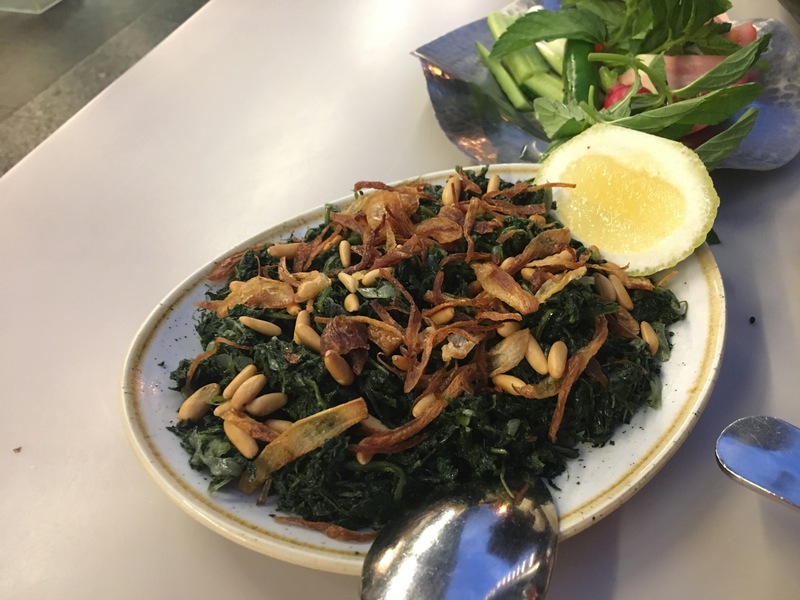 Dandelion leaves with lemon and fried onions at Em Sharif cafe. Panfried sujouk (lamb sausages) at Em Sharif cafe. 6. A friend took me to Kahwet Leila. So I was able to try a bit more dishes. 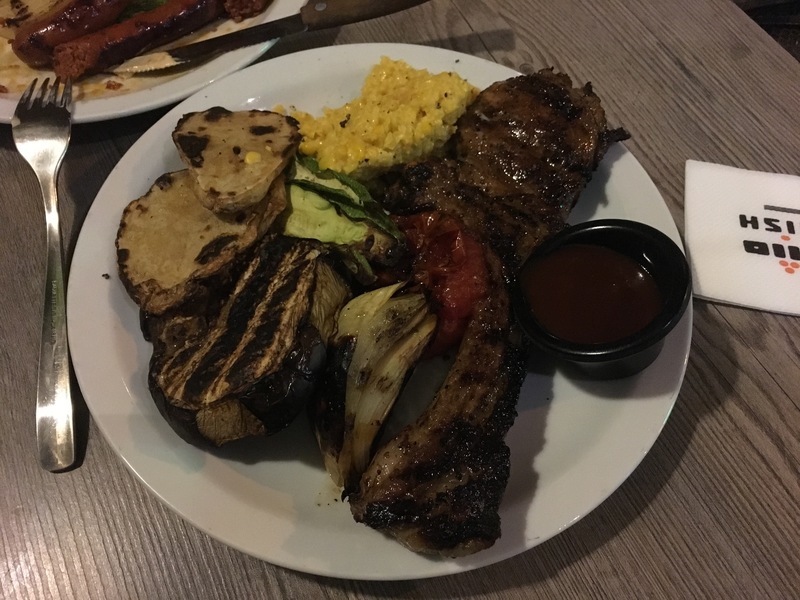 We stuck to hot mezzes, such as lamb kebab with cherry, fried cheese basterma roll (fried cheese roll with dried beef pieces), and pesto ras asfour (tenderloin cubes in pesto sauce with french fries), so that we have room for some sweets. We ordered the platter of three desserts: Mafroukeh Festo (pistachio semolina cake and cream), Osmaliet (fried sweet vermicelli and cream), and Ghazal Beirut (mastic ice cream and cotton candy). I am not into much sweets anymore. From the three, the Osmaliet is my favourite. Our hot mezzes at Kahwet Leila. Our dessert trip at Kahwet Leila. From left to right: Mafroukeh Festo, Ghazal Beirut, Osmaliet (my favourite). 7. Post drinking food: pork chop at Mashawish Grill in Mar Mikhail neighbourhood. It feels weird being in a Middle East country and eating pork publicly, but then Lebanon is an open and tolerant country. Grilled pork chop at Manawish. Perfect post-drinking supper. 8. Restaurant Liza is the prettiest venue I went to, but I cannot claim the food was the most delicious. People goes there for the ambience. I had the fish hummus as starter (I hardly saw fish hummus at other places). For main course, I had the lamb meatballs with bulgur. It was enjoyable. For dessert, I requested half portion and they obliged. I had the Karabij pistachios and natef (cake with cream). The main dining room at Restaurant Liza, Beirut. Daoud Bacha Bel Berghol (lamb meatball with bulgur) and Samak Hummus (fish hummus) at Restaurant Liza. 9. 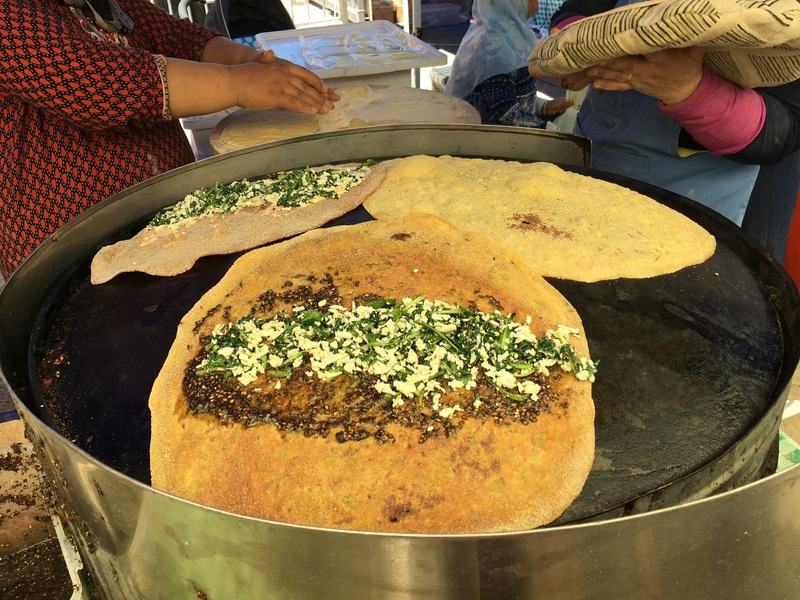 Visiting Souk El Tayeb Farmers’ Market to eat delicious kibbeh (bulgur wheat stuffed with meat) topped with homemade hot sauce and manakeesh (flat bread with filings) prepared by very local women. 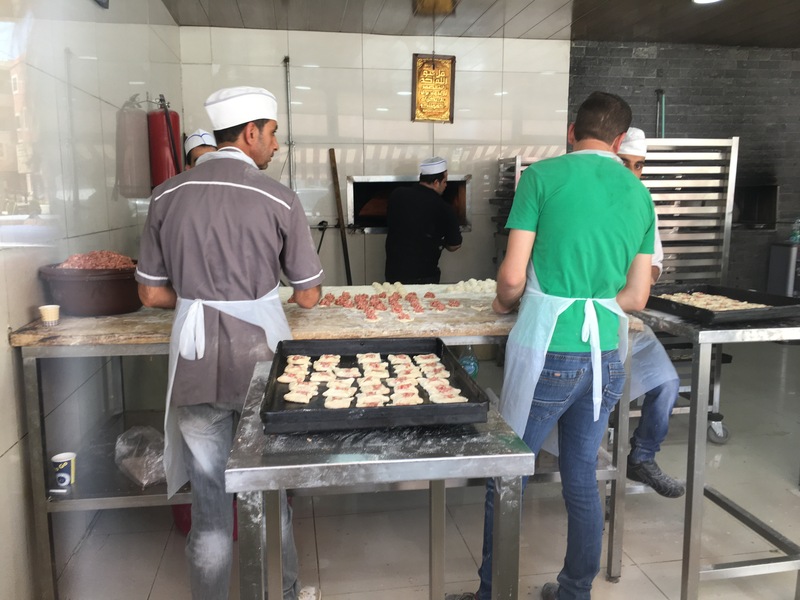 Fresh manakeesh at Souk El Tayeb Farmers’ Market. 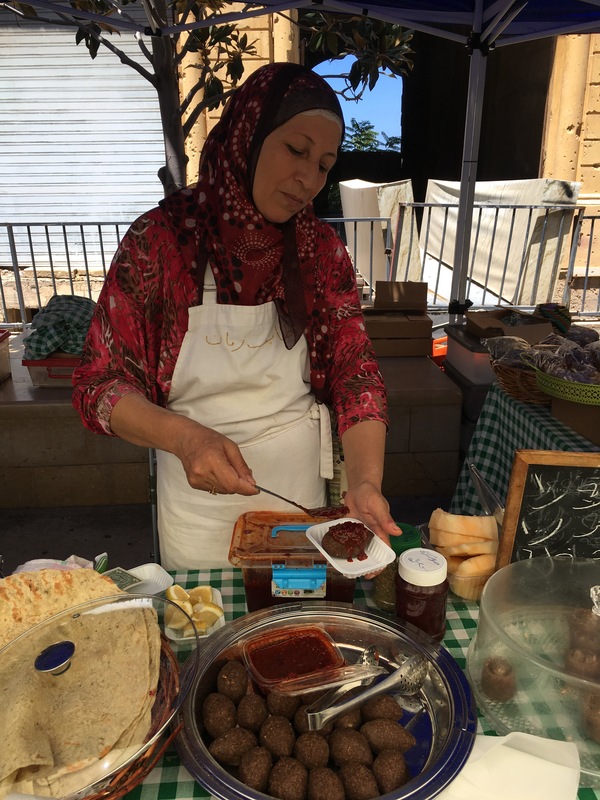 Homemade kibbeh at Souk El Tayeb Farmers’ Market. 10. I cannot stop trying different hummus. At Cafe Libanais, I tried Hummus Beyrouthi. A hummus dish topped with chopped vegetables like carrots and balsamic vinegar. Hummus Beyrouthi at Cafe Libanais. 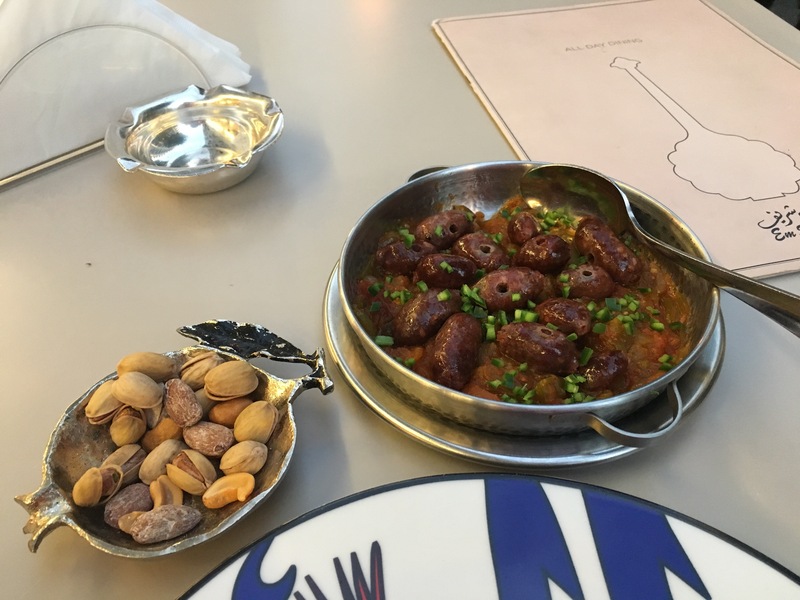 I ate very well in Beirut. To me, Lebanese food is one of the most delicious and diverse among all the Middle Eastern cuisines I have tried. I am addicted to it. I hope you enjoy it, too. #livelovelebanon is the way to go.